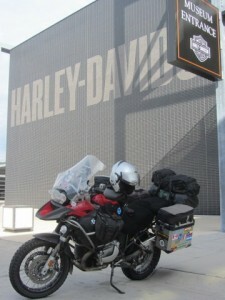 After Leaving South Dakota we head due east towards the Great Lakes dividing the United States from Canada. On the banks of Lake Michigan is Milwaukee, just north of Chicago and not far from Detroit, the centre of USA’s car industry. One of our American friends said “Why Milwaukee?”. 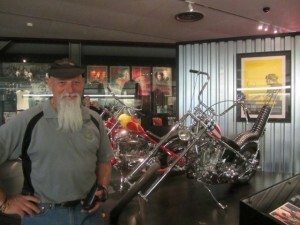 Breweries, the Fonz, Laverne and Shirley and Harley Davidson – that’s why. 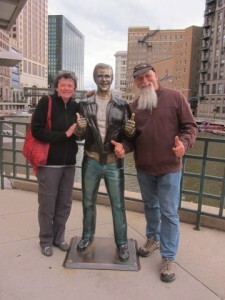 While we didn’t sample too many of the local brews, we did get to meet the Fonz – or at least a statue of him. A local ‘businessman objected so vehemently to the statue that he threatened to close his business if it was erected. It was and he did. 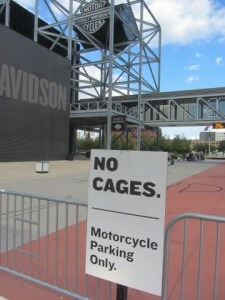 Now it’s a local tourist attraction on the riverfront. While we didn’t find Laverne or Shirley, except the one on the back of our bike – we did find some great local cheeses in a shop. 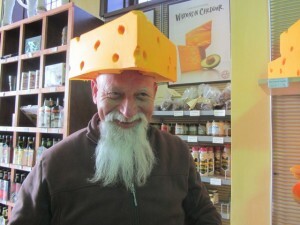 Milwaukie is near ‘Green Bay’ and their Grid Iron team is the ‘Green Bay Packers, they are known as the ‘Cheese heads’. Supporters often were a block of cheese triangle ‘hat’. Brian had to try one on for size. Milwaukee is an industrial city but has a nice historic area downtown. 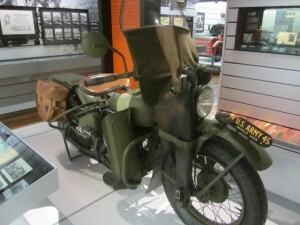 But Milwaukee’s claim to fame is being the home of Harley Davidson. 6,000 workers run the production lines of the iconic brand. 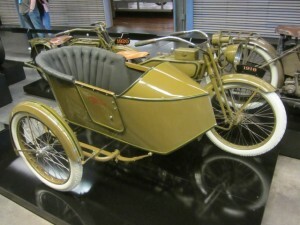 Some say the design hasn’t changed since the first one rolled out of an evolving bicycle shop in 1903. 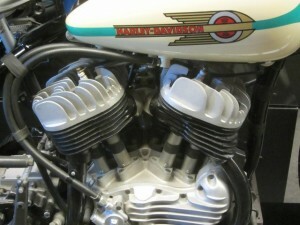 The traditional V twin and ‘potato, potato sound from HD exhaust pipes has been around since then – and hasn’t change that much. 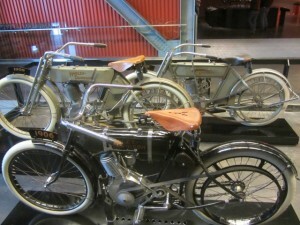 The story of Harley Davidson is of two families with a vision who developed an empire. 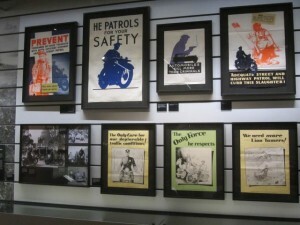 Hard economic times nearly claimed it in the 1970s. All board members chipped in one million dollars and many loyal workers were laid off keeping HD breathing but only just. Within five years the company was once again in dire straits with creditors banging on the doors, yet another deal was done with 30 minutes before foreclosure. HD survived and within six months was listed on the stock exchange and has prospered ever since. Only in America. 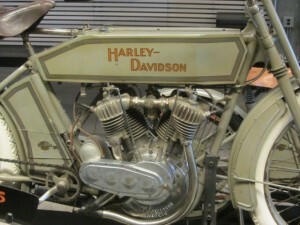 The Harley Davidson is three floors of history with all models lovingly restored and on display. 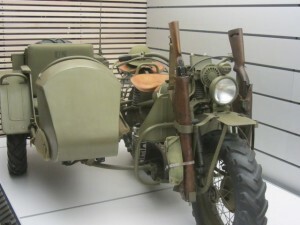 There is even a BMW style engine, shaft drive side car HD built for the army to handle the deserts of Africa. 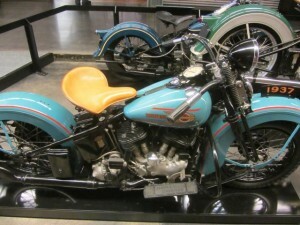 The evolution of Harley Davidson motorcycles is proudly displayed right down to some weird customisations owners do on their machines. 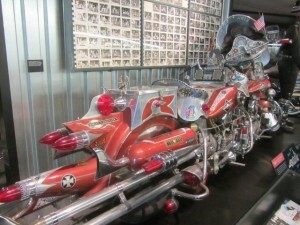 Of course ‘Captain America and Billy Bike’ – or at least faithful re-creations hold centre stage. Leaving Milwaukee can be by land or ferry over the great lakes – if the wind doesn’t get too high. Our ferry was cancelled due to high ‘seas’ leaving us a long ride down the interstates and through Chicago to continue our Eastward trek.